It is free to register!! Premier Tickets is an online event marketing and ticketing agency. 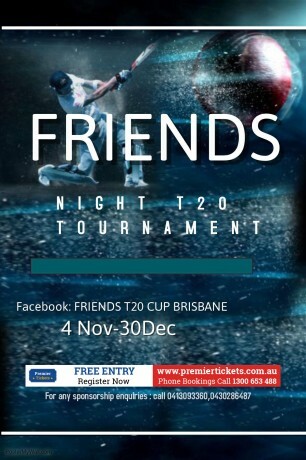 Premier Tickets will NOT be responsible for any changes related to the event schedule, artist, venue or cancellation and refunds related to the tickets for FRIENDS T20 CUP. Premier Tickets Australia is proud to be the online ticketing partner for FRIENDS T20 CUP @ Redbank Plains, Ipswich Queensland.